A young stockbroker eager to get on top becomes the apprentice (so to speak) of a greedy and ruthless broker in this powerful movie directed by Oliver Stone. Michael Douglas gives a fine performance in his oscar winning role as Gorkon Gekko, the man who believes that “greed is good” (he’s also quite persuasive when it comes to money and power). 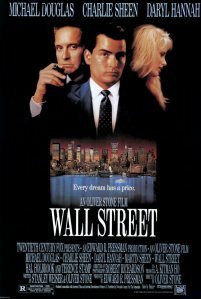 This perfectly acted movie is a must see for any capitalist pig out there; it was a huge success back in 1987, mainly because of the real life insider trading scandal that occured a year earlier. But it still rings true today (maybe even more), and that’s probably the reason why Stone decided to follow it with a sequel in 2010. And remember: it’s all about bucks. The rest is conversation.